Time for a reassessment of rodential wedgies leading up to the election. Today little Johnny laughably dredged up his old favourite – there are terrorists amongst us, folks, so fear, fear, fear – as he desperately tries to regain popularity the best way he knows how. A late November election is now looking likely – Ratty needs all the time for slime he can manage. The attempt to vilify teachers. The attempt to win votes by unnecessary condemnation of AIDS victims. An attempt to reinvigorate “Boatpeoplephobia”. The attempt to bash unions. Smear and muckraking, even having the cheek to try to exploit the WA crime and corruption commission prosecutions when he would NEVER implement a CCC at the federal level. The attempt to blame high interest rates on Labor. May 2/07 Use of Bill Heffernan to slag off at Julia Gillard for being “deliberately barren” and thus unsuitable for public office – the rodent waits a whole day before expressing support for those requiring an apology from the Heffer. The attempt to smear Kevvie via his wife Therese Rein. The attempt to bash unions AGAIN. Reignition of aboriginophobia with the military invasion of indigenous peoples’ communities under the guise of helping the children. Revamping of the old ‘there are terrorists’ amongst us fear campaign. BTW, don’t miss the rubbery rodent skit at she sells sanctuary. Great to see you and sorry for my late response – work is just overwhelming at present – no times for shares fun even! I completely agree with your outlook on the degradation of the US – will there be time to start impeachment proceedings before the vile worm’s term has expired? As the lowest form of life on the planet, Doodoo doesn’t deserve to leave office in a blaze of glory. I also concur with your estimation of the US economy which is headed for a violent downturn and long term slump – unfortunately with our economy wrapped up with theirs, the rodent’s tunnel visioned legacy will hurt us for years. Yet as usual, expect the silvertails to blame Labor for the coming economic disaster, rather than the rat’s lack of foresight when he, like his role model Pig Iron Bob, sold our treasure off a song for the overweaning benefit of their obscenely rich mates without investing sufficiently in human capital which can preserve us through the lean years following feudalistic profligacy. You folks are right on the money and the punters are working hard and with near unlimited credit for every trinket, the work and consume ethic is the popular God of our time. The US is an oligarchy descending into outright anarcho-facism with the politic of fear the driver of the blind slave herd and we are following suit. Aligning himself with GWB, Johnboy will be remembered as the worst manager of largest economic boom in history and who single handedly destroyed the ‘Aussie fair go’ in a time of unprecedented wealth. Your confidence is inspiring, your delineation of the rodential crimes scintillating and eloquent – yet the wily prime miniature may well be saving his smelliest, stickiest mudballs and critical wedgies till they are absolutely needed closer to the election date. Whilst I agree that if the polls don’t improve, we are likely to see a satisfying escalation of the above mentioned activities of disarray and abandonment amongst the ranks with consequent additional downgrading of Lieberal fortunes, I *still* would not put it past Howard to have a couple of dirty aces up his sleeve – he is too much the consummate polly to have shot all his load at this stage. What might he be holding in reserve? As we move closer to election frenzy, I would expect him to up the fear campaign on the economy, and maybe, just maybe, there’s something else on the horizon of which we don’t yet have an inkling – eg. any serious world economic downturn, subsequent interest rate rise (the reserve bank has tellingly held off on these this year) which Howard can then blame not on his own morally bankrupt resource boom dependent fiscal policy but on circumstances beyond his control – then playing the game as “You’ll be safer with the good economic managers you know” in an effort to scare the mortgage and debt ridden little folks back to the fold. Whilst I share your opinion on the electoral unpopularity of WorkNoChoices, I have no misapprehensions on the culture of greed and instant gratification that the rodent has inculcated amongst Australians. Threatened with real prospects of unsustainable debt repayments and a curtailment to their supposed economic gains (at the expense of community gains like education, health etc which have been eroded and mangled under Howard), many will be unlikely to favour an untested ALP treasury. I am of course, hoping that Rudd has a plan to deal with this, and other possibilities. The unsavoury environment of fear and cut-throatedness, not to mention the disgraceful public unaccountability, on which Howard has sustained his reign must be dismantled – it will require a real leader to do it. Enough of this â€œLaborâ€™s win is by no means certainâ€¦â€ rubbish. Iâ€™m quite happy to call the election right now: Labor to win. The reason? Work Choices will be the bedrock. That, and the general distrust of Howard, conscientiously built up of the past 11 years by none other than himself spell doom. The latest Newspoll figures on IR were like a good squirt of Murine right into my tired, bloodshot eyes. Those strongly opposed outnumbered those strongly in support of Work Choices by a factor of two-to-one. Not surprisingly, most of those strongly opposed were in the Labor camp. The observation that the Labor camp is well ahead of the government proves that the anti-Work Choices voters have defected to it. 60% of Labor voters were strongly against, while only 41% of Coalition supporters were strongly in favour; and the Labor voters were a far stronger base, 49% primary to 38% primary for the coalition. 60% of 49% is 29% of the community (not just Labor voters) strongly opposed. 41% of 38% is only 16% of the same community strongly in favour. The voters have sided with Labor because of Work Choices. This is bedrock stuff. Work Choices acceptance can only get worse for the government in the lead-up to the election. Every IR horror story between now and then will be sheeted home to Work Choices. No doubt some of this will be unfairly attributed, but that is the bandwagon nature of mob response once they get those torches and pitchforks on their hands. There are no improvements to be made in Work Choicesâ€™ popularity out there in the electorate, only losses. While Work Choices remains unpopular (and that is a long term prospect) those defecting ex-Howard Battlers will remain with Labor. Their jobs, and the jobs of their children are fundamental to their lives. This is the last chance they have to see off the hated new industrial moonscape that Howard has created, for all the world like Morbiusâ€™s â€œMonster from the Idâ€, straight out of Forbidden Planet. 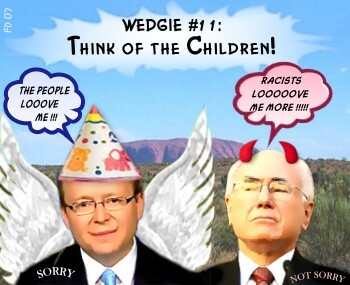 The bleatings of the righties concerning the Burke dinner, Ruddâ€™s mum, supposed union control of Australia (how can 20% of workers – even if they wanted to – control Australia? Itâ€™s absurd! ), unexpected Labor losses in minor, state rural seatsâ€¦ all those tiny minutae, those trivial talking points they keep on dredging up show the paucity of the Howard battle lines compared to the juggernaut of the anti-Work Choices forces. Howard canâ€™t even muster enough enthusiasm from the Business Council to fund an off-the-books campaign in favour of it prior to the election. The underlying distrust of just about anything Howard says out there adds to the reluctance of large slabs of the electorate to take Work Choices seriously. While â€œdistrustâ€ is not an issue in itself, it serves to eat away at the foundations of almost everything Howard tries in his vain attempts to get some traction with the voters on other issues. Lately we have seen diverse issues come together under the banner of â€œdistrust: Ken Henryâ€™s speech the other day confirmed that the Water Plan was a cobbled-together mishmash scribbled out on the back of an envelopeâ€¦ just like we suspected it was. Brendan Nelsonâ€™s panic plan to buy useless fighter jets has exposed the rifts between the professional soldiery and the department that rides roughshod over it. The Hicks case, while generating a lot of heat on both sides of politics, has fallen in a heap. Nobody believes Hicks wasnâ€™t abused during captivity. Nobody believes there wasnâ€™t some kind of deal done, even Howard supporters. After six months boasting of his connection to Bush, Howard can hardly expect us to think the final resolution to Hicks was not his doing almost entirely, tailored to deliver maximum advantage. The $200 million gift to the illegal organised crime loggers of Indonesia and their crony protectors in the Indonesian government is already forgotten, but the stench of desperation remains. And then there is the broken promise on interest rates. $10 billion here, $6 billion there, $200 million somewhere else, interest rates at 10 year highs, housing affordability at all time record lows. This is our money and out homes and livliehoods being flung about by a government desperate to dominate even one news cycle. When will it stop? When we are broke? Or when we vote them out of office and get on with our futures? The farcical freak show of one government minister after another going under the wave of a government sponsored shame and smear campaign hatched to capture Rudd is a laughing stock. Talk about â€œown goalsâ€! Nothing is better calculated to induce the sniggers of the public than a moralising wowser hoisted on his or her own petard, which is exactly what happened to Costello, Howard and Abbott over their much hyped (and bragged about) â€œOperation Destroy Ruddâ€ antics. True, few will be specifically considering these disasters as they stand in the ballot box, pencil poised, but they will be in the background of enough votersâ€™ minds as they realise they have a chance to get rid of Work Choices once and for all with a simple sequence of numerals written into square check-boxs on a ballot paper. But there will be enough of them to have the desired effect: the end of Howard and his divisive ways. Forget the chicken giblets, forget going through the garbage cans in the back alleys looking for something, anything to wedge Rudd and Labor with, forget those little pieces of paper with names and issues scribbled on them that Glen and his mates move around on their desktops trying to find connections, talking points and proof of Howardâ€™s alleged genius. Itâ€™s over. The Newspoll oracle has spoken. While the exact â€œvoting intentionâ€ figures are arguable, the Work Choices figures are not. People are pissed-off, angry and scared of what will happen when we can no longer dig holes in the ground and flog off our continent tonne by tonne to the Chinese. Nothing can improve the governmentâ€™s position as long as Work Choices remains the central plank of their policy. It is hated by too many people, from all walks of life, in all socio-economic groups to survive the election. The rest – the defence fiascos, the Iraq debacle, the Hicks disgrace, the freebies handed out to anyone who puts a half-plausible case for a government subsidy, the middle class welfare bribes, interest rates and so on add to it, but Work Choices remains the issue that is going to lose Howard the election. Itâ€™s the rallying point for all the other disaffections people feel about this government. Itâ€™s a symbol of what can go wrong when uninhibited ideology meets untrammelled power. Itâ€™s a hangmanâ€™s noose for Howard and he knows it. The beauty is that heâ€™s too arrogant to admit the truth, and too stubborn to do anything about it. Over the coming months expect panic, bad decisions, more leaks, defections, retirements from and in the Howard camp as they realise their Master is leading them down the road to oblivion. These coming disasters for the government will only make things worse in the Battlersâ€™ eye, like a giant political feedback loop. By the time the election comes around voters will be queueing up at 8 oâ€™clock outside of polling booths nationwide to rid the world of them, their wedges and their divisive â€œUs Against Themâ€ wet dreams, once and for all.